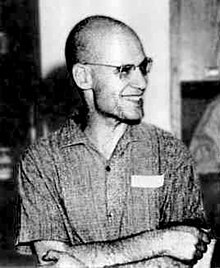 Alexander Grothendieck (28 March 1928 – 13 November 2014) was a German-born French mathematician who became the leading figure in the creation of modern algebraic geometry. His research extended the scope of the field and added elements of commutative algebra, homological algebra, sheaf theory and category theory to its foundations, while his so-called "relative" perspective led to revolutionary advances in many areas of pure mathematics. It is less than four years since cohomological methods (i.e. methods of Homological Algebra) were introduced into Algebraic Geometry in Serre's fundamental paper, and it seems certain that they are to overflow the part of mathematics in the coming years, from the foundations up to the most advanced parts. ...  Serre, J. P. Faisceaux algébriques cohérents. Ann. Math. (2), 6, 197–278 (1955). I can illustrate the ... approach with the ... image of a nut to be opened. The first analogy that came to my mind is of immersing the nut in some softening liquid, and why not simply water? From time to time you rub so the liquid penetrates better, and otherwise you let time pass. The shell becomes more flexible through weeks and months — when the time is ripe, hand pressure is enough, the shell opens like a perfectly ripened avocado! A different image came to me a few weeks ago. The unknown thing to be known appeared to me as some stretch of earth or hard marl, resisting penetration ... the sea advances insensibly in silence, nothing seems to happen, nothing moves, the water is so far off you hardly hear it ... yet finally it surrounds the resistant substance. Alexandre Grothendieck was very different from Weil in the way he approached mathematics: Grothendieck was not just a mathematician who could understand the discipline and prove important results—he was a man who could create mathematics. And he did it alone. Amir D. Aczel (29 April 2009). The Artist and the Mathematician. Basic Books. pp. 54. ISBN 978-0-7867-3288-3. No one but Grothendieck could have taken on algebraic geometry in the full generality he adopted and seen it through to success. It required courage, even daring, total self confidence and immense powers of concentration and hard work. Grothendieck was a phenomenon. Michael Atiyah (2014). Michael Atiyah Collected Works: Volume 7: 2002-2013. Oxford University Press. p. 429. ISBN 978-0-19-968926-2. He really never worked on examples, I only understand things through examples and then gradually make them more abstract. I don’t think it helped Grothendieck in the least to look at an example. He really got control of the situation by thinking of it in absolutely the most abstract possible way. It’s just very strange. That’s the way his mind worked. Weil's new mathematical language, algebraic geometry, had enabled him to articulate subtleties about solutions to equations that hitherto had been impossible. But if there was any hope of extending Weil's ideas to prove the Riemann Hypothesis, it was clear they would need to be developed beyond the foundations he had laid in his prison cell in Rouen. It would be another mathematician from Paris who would bring the bones of Weil's new language to life. The master architect who performed this task was one of the strangest and most revolutionary mathematicians of the twentieth century - Alexandre Grothendieck. Marcus du Sautoy (31 May 2012). The Music of the Primes: Why an unsolved problem in mathematics matters. HarperCollins Publishers. p. 178. ISBN 978-0-00-737587-5. Applications in arithmetic geometry (such as Weil conjectures, Ramanujan conjecture, Mordell conjecture, Shafarevich conjecture, Tate conjectures) are unthinkable in the classical style, these really need Grothendieck's foundations of algebraic geometry. Leila Schneps; Pierre Lochak (10 July 1997). Around Grothendieck's Esquisse d'un programme. Cambridge University Press. pp. 70. ISBN 978-0-521-59642-8. In Récoltes et Semailles, Grothendieck counts his twelve disciples. The central character is Pierre Deligne, who combines in this tale the features of John, "the disciple whom Jesus loved”", and Judas the betrayer. The weight of symbols! Jean Dieudonné and Laurent Schwartz were able to discipline Grothendieck just enough to prevent him from running off in all directions, and to restrain his excessive attraction to extreme generality. Grothendieck’s undertaking throve thanks to unexpected synergies: the immense capacity for synthesis and for work of Dieudonné, promoted to the rank of scribe, the rigorous, rationalist and well-informed spirit of Serre, the practical know-how in geometry and algebra of Zariski’s students, the juvenile freshness of the great disciple Pierre Deligne, all acted as counterweights to the adventurous, visionary and wildly ambitious spirit of Grothendieck. Cartier, Pierre (9 April 2004), "Un pays dont on ne connaîtrait que le nom (Grothendieck et les " motifs ")", in Cartier, Pierre; Charraud, Nathalie (in French), Réel en mathématiques-psychanalyse et mathématiques, Editions Agalma, English translation: A country of which nothing is known but the name Grothendieck and "motives". Illusie: In retrospect, I find it strange that representation theory and automorphic forms theory were progressing well in the 1960s but somehow ignored in Bures-sur-Yvette. Grothendieck knew algebraic groups quite well. Bloch: Well, as you said, there are only twenty-four hours in a day.